Is Berger Paint a Buy Now? Berger paint has given a bounce back above 196 level and it shows that in times to come 196 is going to be a strong support for the stock. As of now we can see that Berger Paints is within a rising trend. We see that stock will show a positive development within the trend channel is indicated and thus we see stock rising to the level of 240-250 provided the level of 223 is held. If the stock is able to move above 223 level with volume; then we see stock heading for the level; of 250 which will then act as a strong resistance. The trend is confirmed as upmove is confirmed by the volumes which shows that bull force is moving into the stock. The stock is likely to give good returns in short term to medium term perspective. Remember to shift the stop loss to 223 level; once this level is broken with volume. 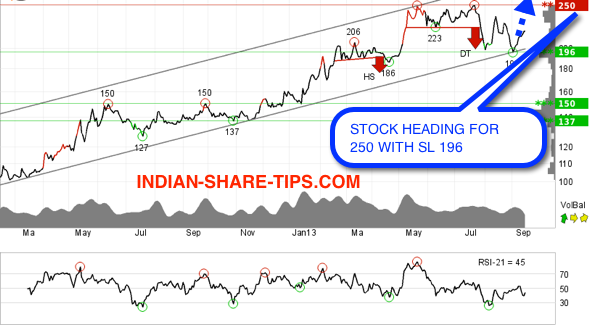 Have a look at stock chart now. We have been long in this stock earlier also and this stock remains our darling bet. However remember that when the given resistance levels are broken than you need to divorce the stock and one need not get permanently married to stock as dynamism is the key to success. Wanna taste success like ours then do not forget to join our Jackpot tip for your intraday requirement and delivery tips for your short term requirement.